* Intel Skulltrail platform support (Core 2 Extreme QX9775 + 5400B MCH). * Intel X48 chipset detection. * AMD Athlon 64-LE 1600 and 1620 support. * Fix detection issues on unlocked Phenom (ES/BE). 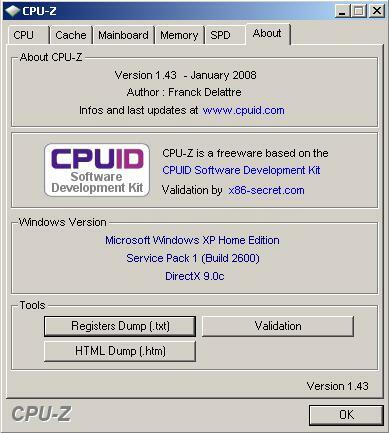 Hosted by CPUID, this small utility provides a rather informative data about your motherboard, memory and graphics card. One instance is that you can find out the speed of your RAM, e.g. PC-2700 or PC-2100, or the chipset of your microprocessor. The good thing is that CPU-Z does not need to be installed. Simply unzip the files in a directory and run the .exe program (see screenshot). To remove the program, users only need to remove the entire directory. This entry was posted on Tuesday, January 22nd, 2008 at 3:05 am and is filed under Fun Stuff, Site News, Utilities, Windows . You can follow any responses to this entry through the RSS 2.0 feed. You can leave a response, or trackback from your own site.